The tsuyu (the rainy season) is well underway in Japan, but don't despair: even monsoon clouds have silver linings, and with the rainy season comes ume. Ume (Japanese apricot*) is so strongly associated with the season that that the word tsuyu literally means "ume rain": 梅雨. 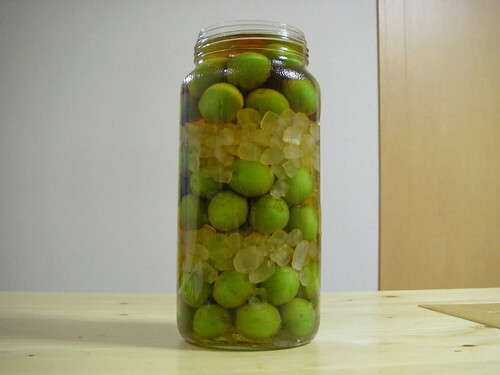 And the best thing to do with ume is to make umeshu (ume liqueur*). Sure, it won't actually be ready for a year, but the preparations are a great indoor activity that will keep your mind off the downpour outside, and when the rainy season starts again next year you'll have something to cheer you up. Each year before the rain begins every supermarket in the land puts up a special display piled with bags of green ume, large glass jars, cartons of alcohol, and bags of rock sugar. This is for umeshu, and it seems like every housewife in the country makes it. Those grocery store displays stay put for a month or two, with the green ume being replaced with yellow and red varieties and with additions like salt, akajiso (red perilla) and giant bamboo sieves. These are for making umeboshi (salt-pickled ume, or pickled plums). Umeboshi is a bit fiddly to make so I've never attempted it, but there's nothing easier than making liqueur. Anyone can do it, so if you live in Japan (or have access to ume) and have half a day free in the next week or so, now is the time to give it a try. But hurry--the umeshu making season is nearly over, and the green ume will soon disappear from the stores. 青梅 (ao-ume: literally "blue ume", this is unripened ume) is used for umeshu. Choose bright green fruit free of blemishes (ripening fruit is splotched with yellow and red and is used for umeboshi). 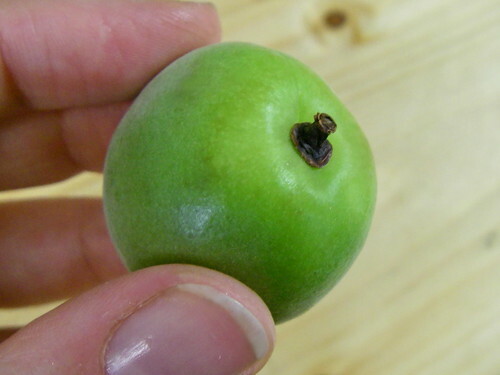 The tiny 小梅 (ko-ume: small ume) can also be used, but are said to be slightly more astringent and sour. Buy the ume just before making your umeshu, as it doesn't keep very well. Note that unprocessed ume is mildly toxic, so don't be tempted to have a taste! 氷砂糖 (Koori-zatou: literally "ice sugar", this is rock sugar) is most often used, but any kind of sugar works. Koori-zatou is conveniently sold in bags weighing 1 kilogram, the amount most often used, but you can use anywhere from 500 grams to 1500 grams depending on how sweet you'd like your liqueur to be--if you're not sure it's better to go with less sugar as more can always be added later, while there's not much you can do to fix an overly sweet liqueur. Note that the less sugar used, the longer the umeshu will take, as sugar helps extract the flavour from the ume. Honey (蜂蜜 or はちみつ) can replace all or some of the sugar: use 2 cups of honey or 1 cup of honey with 500 grams of sugar. The umeshu will take longer this way, and for the first few weeks the jar will need to be turned frequently to help dissolve the honey. ホワイトリカー (Howaito rikaa: white liquor) is most often used. It is a clear 35 proof alcohol, similar to shochu, sold in 1.8 litre cartons. It tends to be a bit harsh, but the sugar and ume flavour will mellow that out after time. If you plan on using less than the standard amount of sugar, or if you'd like to drink your ume quickly, you might want to use a good-quality vodka instead. Brandy is also popular, producing a mellower, sweeter and more fragrant liqueur. Good brandy can be used, but Suntory produces a cheap version conveniently sold in a 1.8 litre carton labeled 果実の酒用 (kajitsu no sake you: for fruit liqueurs). Jars specially made for liqueur are commonly available in Japan. Made with thick glass, they have a wide opening and a double lid with a handle (smaller sizes have the handle on the side of the jar itself). The jars come in various sizes, with the 4 litre type being used for the standard umeshu recipe (I used a 2.2 litre jar as I made a slightly smaller than usual batch). Here I have 1 kilogram of ao-ume, a 2.2 litre jar, 1.8 litres kajitsu no sake you brandy, 1 kilogram koori-zatou. I started a bit late and the only ume I could find were a bit old, so I had to throw several out. So I only used about 1 litre of the brandy and 500 grams of sugar--basically all that could fit in the jar. Because it has a higher ume-to-alcohol ratio it will take a bit longer than usual, and if it turns out too strong I may dilute it with a little more brandy. Anyway, the point is that the exact amounts are not terribly important, and as long as the fruit is completely covered by the alcohol you'll be fine. The jar, sugar and sake will come with a recipe for umeshu. The jars usually have the most comprehensive instructions, and this one has recipes for several types of liqueurs, along with a seasonal guide. 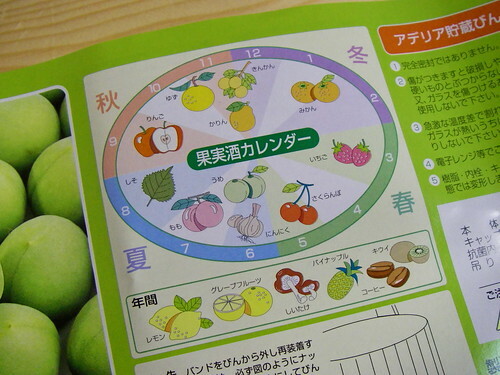 It recommends mikan (clementines) in January and February, strawberries in March, sakurambo (white cherries) in May, garlic and ume in June, peaches in July, shiso (perilla) in August, apples in September, yuzu (citron) in late October and early November, and karin and kinkan (quince and kumquat) in November and December. Year-round liqueurs can be made with lemons, grapefruits, shiitake, pineapple, coffee beans, and kiwi; elsewhere on the label is a recipe for aloe liqueur (the garlic, shiso, shiitake, and aloe liqueurs are used for health tonics--I've never tried any odd ones like that and hope I never have to). These are just a few ideas, and virtually any fruit--or combination of fruit--can be used for liqueur, with fragrant and strongly-flavoured being the best choices. Keep in mind that fruit that starts out sweet and edible will require less sugar than ume, and will be ready faster. Check the web for fruit-specific recipes--there are a lot of liqueur makers out there, not just in Japan but all over the world. For starters, here's my strawberry liqueur recipe from a few years back. So let's begin. The first thing to do is wash the jar and lids with hot water and soap (if you're using heat-resistant glass you can sterilize the jar with boiling water, but the type of jar sold for liqueur making in Japan is not heat safe so cannot be sterilized this way). After washing, you may like to use a little of your alcohol to rinse the inside of the bottle and the inner lid. Allow to air-dry. Next, wash your ume. Just water is fine, but unless you're using organic ume there will be traces of pesticides, so use soap or a vinegar solution if you like--just make sure to rinse well afterwards. Drain in a large colander, then lay the ume in a single layer on some towels and allow to air-dry. This may take a few hours so start early, and don't be tempted to go to the next step while the ume are still wet--water can make the ume go moldy, even when steeping in alcohol. When the ume are completely dry, use a toothpick or bamboo skewer to remove the stems from the ume. Not all of them will have a nice big stem like the one below, but however small the stem remnants are, they must be removed. While you are removing the stems, inspect the fruit and discard any that are cut, overly bruised, or moldy. Don't worry about minor blemishes. 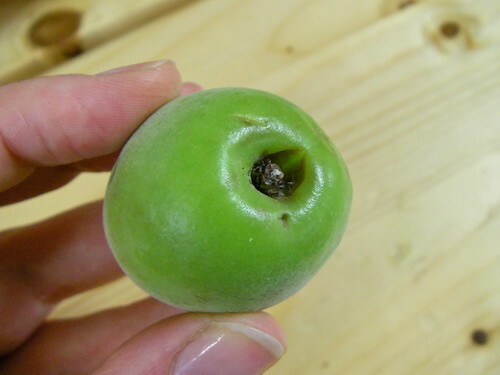 My ume were a little less than fresh, so a few of them were starting to get moldy at the stem like the one below, and a few more were heavily bruised. Those ones didn't make the cut. 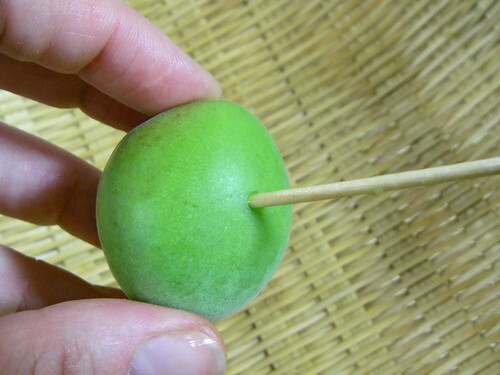 Next, use a new toothpick or bamboo skewer to prick holes in the ume. This step is not vital and many recipes omit it, but it will help make things go a little faster. 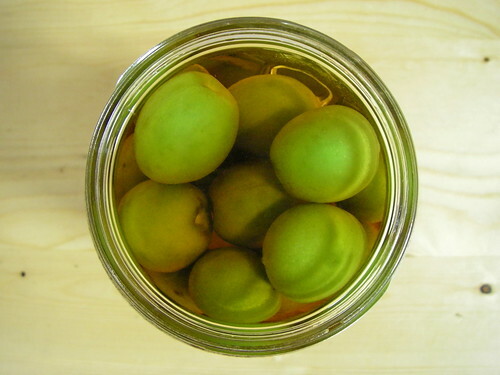 Each ume gets two or three holes and goes directly into the jar. 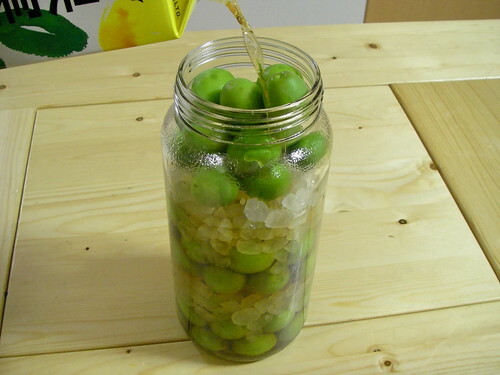 After about a third of the ume are in the jar, cover them with about a third to half of the sugar. Continue pricking the ume and adding them to the jar, layering it with the sugar as shown until you've used all of the ume and sugar. This layering is not really necessary, and in fact all the sugar will be at the bottom and the ume will be floating at the top after a day or two. But most instructions say to do this, and it looks cool, so I keep doing it. When you've used all of your ume (or when the jar is full) pour in your alcohol. If you're using the standard recipe with a 4 litre jar you'll use up the full carton of white liquor, with a bit of room leftover. If you're using a smaller jar and can't fit in the entire carton of alcohol, don't worry--just make sure the ume are completely covered by the alcohol, as shown above. And you're nearly done. 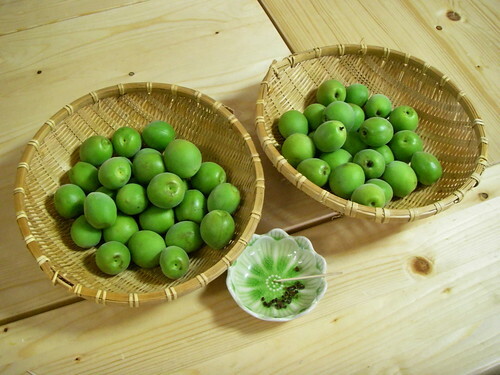 Take a look and enjoy how pretty it is, because it won't last: the ume will quickly lose its green colouring and will turn wrinkly and yellowish. Cover with jar with the inner lid, making sure it is tightly sealed and the spout and air hole are covered. 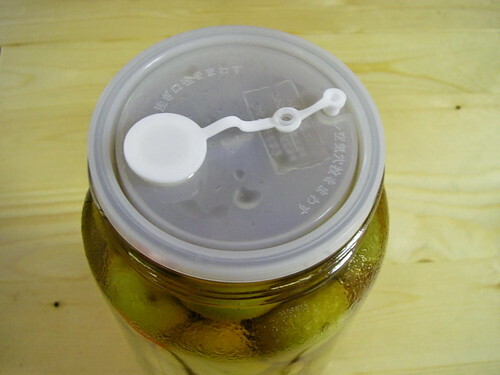 Seal with the outer lid, and don't forget the to label the jar. Liqueur jars come with labels. This one has space for ingredients, alcohol type, date the liqueur was made, and date it will be ready for drinking. This label uses the Japanese way of writing dates and this is what I entered: 20th year of Heisei, 6th month, 9th day (June 9th, 2008). I'm guessing the liqueur will be ready for tasting in September, but I think I'll let it steep for a full year. Put the jar in a closet, cupboard or other dark place in the coolest room of your house (if you have a yuka-shita, or under-floor storage space, keep it there). Every few weeks shake the jar a little to help dissolve and disperse the sugar. This is the liqueur after just one day. The sugar has already fallen to the bottom and is starting to dissolve. In two to three months the umeshu will be drinkable, but you'll want to leave the ume in for longer than that: six months is standard but you can take them out after anywhere from four and a half months to a year. 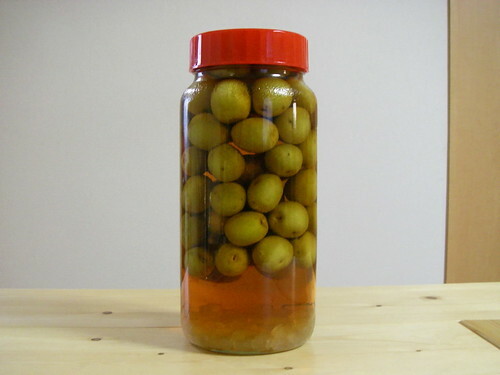 There are two ways to remove the ume: if you'd like to keep the umeshu in its original jar, use a clean and dry ladle or pair of tongs to fish the ume directly out of the jar. But you may want to use the jar for a new batch of liqueur, so set a large funnel inside of a clean, dry bottle, set a colander inside the funnel, and carefully pour the umeshu into the bottle. The spent ume are soft, wrinkly and completely delicious. Keep them in the fridge or freezer and eat as-is; plop one or two into a glass of umeshu or umeshu-based cocktail as a kind of edible garnish; simmered to further soften them and burn off the alcohol and then used as a topping for ice cream or yogurt; chopped up and made into jelly or jam; or cooked with nizakana (simmered fish), as the the flavour helps cut fishiness. I am not very creative with my used ume and always end up throwing most of them out because I need the fridge space, but apparently a clever housewife can find endless uses for them. Warning: they have a lot more alcohol than they seem to, so try to limit yourself to a few at a time! As for the liqueur itself, it doesn't need to be refrigerated, but you may want to pour some into a small bottle to keep in the fridge so you always have some nice cold stuff on hand. Otherwise, keep it where you keep your liquor--preferably in a cool, dark and dry cabinet. It will continue to improve as it ages and will keep for a very long time, but after a decade or so will start to darken and take on bitter notes. I've drunk umeshu that is older than I am, and it was nearly black and had strong nutty and bitter flavours. I didn't find it very pleasant, but some people really like old umeshu. So that's it for umeshu instructions. If anyone has any tips, umeshu cocktail recipes, ideas for using up the used ume, or anything else to add, please leave a comment. * Note about translations: I have a pet peeve about poorly translated Japanese words and especially hate seeing the words "ume" and "umeshu" translated incorrectly. Ume is sometimes mistakenly called "plum", but is actually the fruit of Prunus mume, commonly known as "Japanese apricot" (what we know as plums are called sumomo or prune in Japanese). 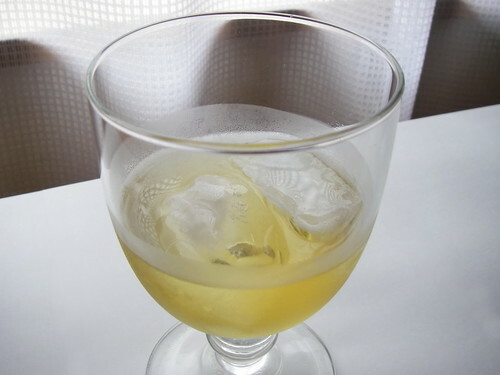 Umeshu is often incorectly translated as "plum wine", but it's neither wine nor made with plums. Just call it "ume liqueur" or "umeshu", damn it! I like ume wine, but I find it too sweet and syrupy for everyday consumption. I like 1 part of it with 1 part soda water over ice. Refreshing! Thanks for posting this... I may have a go at making my own ume wine in the next week or so! Having said that, I have some ume left over from a jar that my MIL gave me last year. Do you have any suggestions as to what I can do with the leftover ume? I'm going to have to give umeshu a try too! I made umeboshi a couple of years ago - they turned out slightly too salty but otherwise were great, and not too fussy to make. p.s I totally agree with you on the translation issue. Anyone who calls an ume a plum has obviously never seen a ripe one. ohh thank you, I hope the super still has a good stock of stuff in,I have been wanting to try this for years. Great article! Thanks a lot. Do you know if it's allowed to take home-made umeshu with you on a plane? I think it would make a cool gift for people back home. wow, garlic liquor! i wonder if i could use american apricots for this...my tree is going crazy right now and i love umeshu. however, they might be too ripe already. When I was younger I would just pop those rock sugar clumps into my mouth and enjoy them as I would candy. This looks really good, I've got to try it sometime! I like how convenient it is to get cartons of liqueur. Awwwwwww... Ume is actually an apricot? (heard it translated as plum for years) But I'm a little sad now, I love umeboshi, but since I moved away from the city, into the middle of rural America, I can't find 'specialty' items like that anymore. I was hoping to make some umeboshi with some small plums my in-laws had produced, but now I'm not sure. oh, this is gorgeous amy!! i have been wondering (for a couple of weeks, now) whether or not i should make some umeshu. i made some a few years ago and have been recently enjoying it (no longer pregnant, yay!) so, i did!! it should be great by next june. thanks! Thanks for the recipe and explanation. I'm drying my ume right now. Kind of expensive to make though, about 2500 yen for the ingredients, not including the jar. I'll be scouring my local Japanese supermarkets for ume! 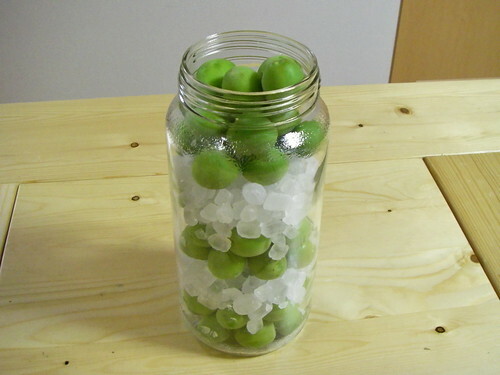 I love umeshu and it'd be amazing to make my own. Recently I went to a shop in London that sells wagashi and bought a umeshu jelly, which I've yet to try! Right, Amy! Umeshu is umeshu and Okonomiyaki is no way Japanese pizza! Amy, are there any Japanese words or phrases that you find difficult to translate in English? A most enjoyable tutorial on homemade umeshu! Have learnt a lot just by reading! Thanks for such detailed effort! Ms J, other than the ideas mentioned in the post I really don't know. I usually just have to throw them away, which I know is a waste. I think I will try jam next time--a student just gave me some ume jam (made with fresh ume though) and it's delicious. Thomas, as long as you packaged it nicely and kept within the allowed alcohol limit I don't think it would be a problem. Deas, absolutely on both accounts and I should have mentioned that, so I've just updated the post. Thanks! Allison, you could do it, but you'd end up with apricot liqueur. Not umeshu but definitely delicious. Illahee, I hope yours turns out great! Brian, it will work out to be cheaper than if you bought the umeshu premade, and much tastier. But 2500 yen sounds a bit pricey--I guess you bought good Wakayama ume? TA, that's a great question and now that I think about it there are a ton. Actually umeboshi is one, and I tend to call it "pickled plum", which is so wrong but a more accurate name would be cumbersome. Matcha is another: I hate when it's called "green tea" because that's what regular Japanese tea is called and it's not the same thing. I also hate "powdered green tea" because it sounds like you are consuming it as a powder. And why does the form it comes in need to be part of the name? I mean, you don't go around saying "I drank some ground coffee", do you? I wish people would just call it "matcha" or "matcha tea". I'm really looking forward to the post, and it doesn't have to be about the food; it can be about almost anything you've found difficult to put into English. I've been a bit of a fan of your blog. Today (a bit late I know), I found some nice ume at a little yasaiya in Shimotakaido, dutifully followed your recipe and am looking forward to next year when the umeshu will be ready. Thanks! Kampai! This is just what I was looking for; thanks for the detailed post. Hopefully my local Japanese supermarket will come through on the ingredients...I have three different recipes for cherry liqueur steeping now. Have you ever made momoshu? I've never drunk it before but I am curious after reading your post, especially since it is too late to buy the right kind of ume. I found a recipe here. 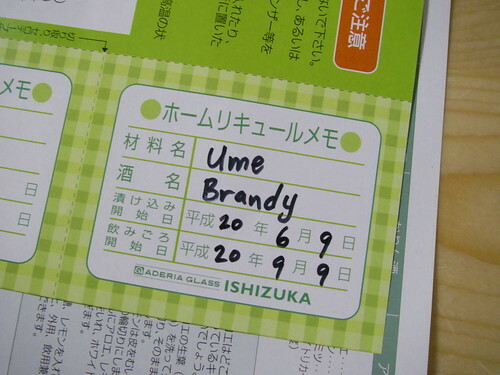 To be honest I never knew that ume was apricot, and I have studied Japanese for 4 years! Thanks for the information, and I am glad that I know that now. Really great info! Now I have a fun idea for my days off! Noticed your Strawberry liqour recipe. A small question about the Umes... It is impossible to find unriped Umes in Sweden... I found some riped... Can I use it for Umeshu? Thanks for the tips and I hope all of your umeshu turns out great! Kirsten, I've never made momoshu. Partly because peaches are so expensive here, and partly because Japanese peaches have too little fragrance and are too delicately flavoured. I figure that would be a better one to do back home. Vilda-Hilda, it certainly is possible. Green ume are preferred for their tartness and fragrance, but some people do use ripe ume and the result is a sweeter, mellower umeshu. It's the only way I'll drink brandy actually. 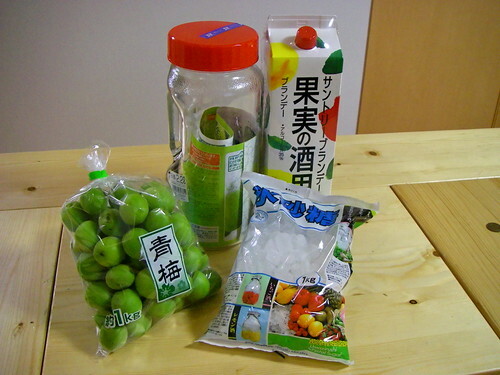 When we move to Japan soon, I'll keep my eyes open for the green ume and try umeshu. Do you have any experience with "really old" umeshu? Any suggestions?